A student asked that we trial TRAC Terrorism, so a trial is now under way at both Middlebury College and the Middlebury Institute, ending May 30th. Created by The Beacham Group, LLC, Terrorism Research & Analysis Consortium (TRAC) is a uniquely comprehensive resource for the study of political violence of all kinds. In cooperation with a team of 2800 experts, TRAC gathers the best information for exploration of this topic by faculty, scholars, students, government and defense professionals, as well as the general public. Is there something you’d like the Middlebury libraries to trial? Let us know at go/requests. This entry was posted in Midd Blogosphere and tagged library collections, Library Spotlight, Middlebury Community Interest, Post for MiddPoints, trials, trials FY 2015 on May 4, 2015 by Arabella Holzapfel. Middlebury has two-week trial access to the iPoll Databank from the Roper Center at the University of Connecticut, one of the world’s leading archives of social science data, specializing in data from public opinion surveys. Check it out and let us know what you think – email eaccess-admin@middlebury.edu or your liaison. This entry was posted in Midd Blogosphere and tagged library, Library Spotlight, Post for MiddPoints, trials, trials FY 2015 on March 31, 2015 by Arabella Holzapfel. This entry was posted in Midd Blogosphere and tagged library collections, Library Spotlight, LIS Staff Interest, Post for MiddPoints, trials, trials FY 2015 on February 16, 2015 by Arabella Holzapfel. and much more. Explore, and let us know what you think – email eaccess-admin@middlebury.edu or your liaison. 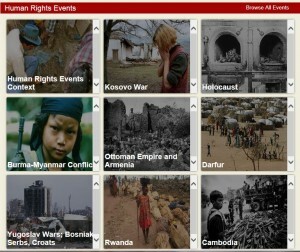 Through March 20th, students, faculty, and staff affiliated with both Middlebury College and the Middlebury Institute of International Studies at Monterey will have trial access to a Human Rights Studies Online – a research and learning database providing comparative documentation, analysis, and interpretation of major human rights violations and atrocity crimes worldwide from 1900 to 2010. This collection includes primary and secondary materials in multiple media types. Look it over and let us know what you think! Email your feedback to eaccess-admin@middlebury.edu or your liaison. If there’s something you’d like the library to explore or purchase, let us know at go/requests. This entry was posted in Midd Blogosphere and tagged library, library collections, Library Spotlight, trials, trials FY 2015 on January 26, 2015 by Arabella Holzapfel. Alexander Street Drama brings together thousands of plays from Alexander Street’s individual full-text drama collections and makes them accessible and cross-searchable in a single package. It includes the complete content of:. Everything is cross-searchable through the unified North American Theatre Online interface, with the results seamlessly integrated into one search result. This entry was posted in Midd Blogosphere and tagged library, library collections, Library Spotlight, trials, trials FY 2015 on October 16, 2014 by Arabella Holzapfel. Members of the Middlebury community have free access to the Computer Science Digital Library from the Institute for Electrical and Electronic Engineers (IEEE) for two weeks, ending October 22, 2014. Included in the CSDL are over a dozen journals, many “Transactions of the IEEE” and hundreds of conference proceedings. This entry was posted in Midd Blogosphere and tagged library, library collections, Library Spotlight, trials, trials FY 2015 on October 9, 2014 by Arabella Holzapfel.